Home Travel Road trips in Thekkady that bring you close to nature! Road trips in Thekkady that bring you close to nature! Kerala often evokes an image of evergreen forests interspersed with plantations, tea gardens spanning to infinity, shorelines dotted with coconut trees and quaint houseboats making their ways through the backwaters. However, not many associate Kerala with road trips. 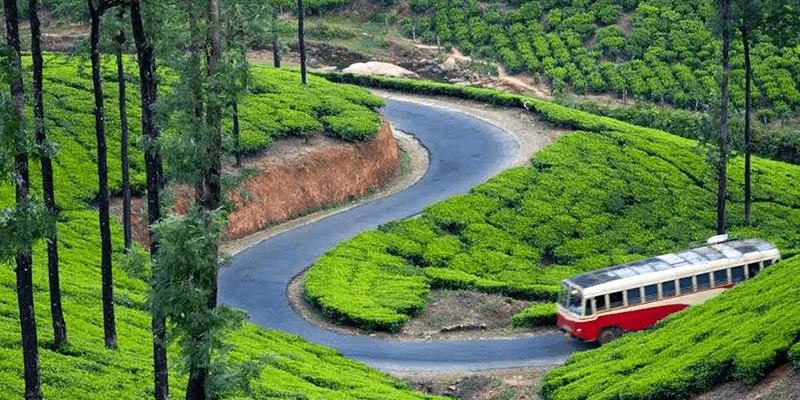 But the green roads of Thekkady in Kerala, offers ample motivation for the tourists to hit the road and experience eco-tourism in Kerala like never before. 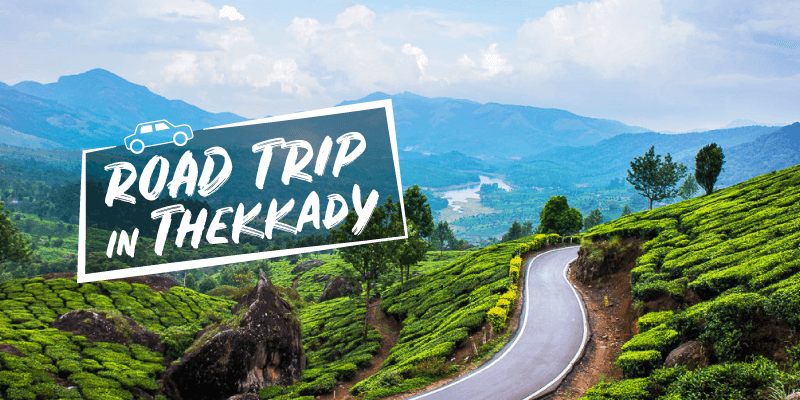 The road trips we are about to explore in this blog, helps you visit all the Thekkady sightseeing destinations and get a feel of the local culture. 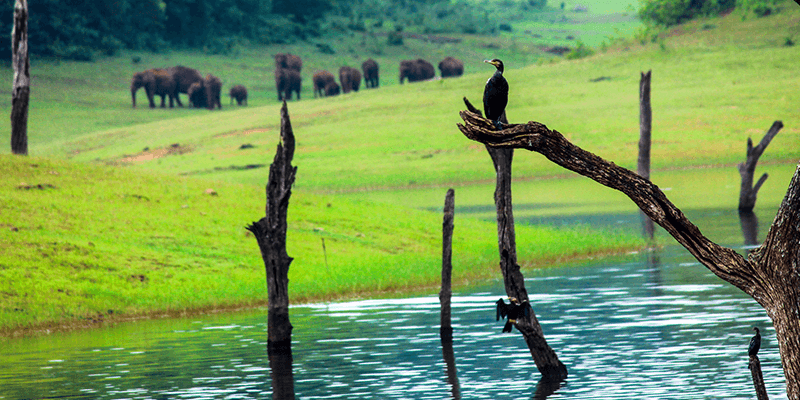 So, let us be your Thekkady travel guide and tell you about the scenic routes that you can explore. This round trip journey starts from Thekkady, traverses along the Kumily Road and reaches the Kerala-Tamil Nadu border. The getaway helps you explore the best of both states – Kerala and Tamil Nadu. As you drive through this road, you will find the scenery changing intermittently leaving you in awe for more. This is one of the most beautiful roads in Kerala and it takes you through many tourist places (such as Ottakathalamedu, Chellarcovil waterfall and Pandikuzhy). While on the Tamil Nadu side there are other sightseeing hotspots such as Lower Camp and Canal view and grape plantations. Your first stop along this route should be the ever beautiful Ottakathalamedu. Situated at an altitude of 1300m above sea level, Ottakathalamedu is one of the upcoming tourist places in Kerala. As you alight from the car, you will find yourself surrounded by cotton clouds. 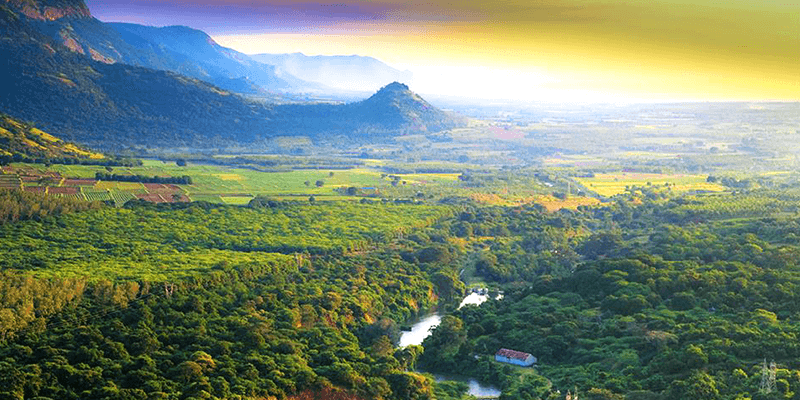 But, the biggest attraction of Ottakathalamedu is its Cliffside viewpoint that offers an astounding 360 degree view of spice plantations, Periyar Tiger Reserve and a few villages of Tamil Nadu. Trivia: If you are a sunset person, this is an ideal location to be. Tip: Don’t get too close to the cliff as they are very steep and narrow and if the wind is strong, you might easily lose balance. 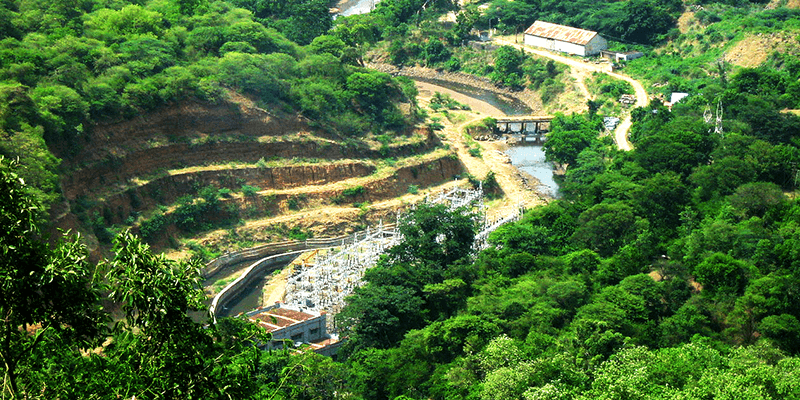 Situated some 10 KM away from Ottakathalamedu, is the mesmerizing Chellarcovil waterfalls. If you have ever dreamt of going till the tip of the waterfall, then Chellarcovil will fulfill your wish. Once you get down from the car, keep on following a brook, it would soon lead you to the tip of Chellarcovil waterfalls. Viewing gallons of water stream past and then dive down from the heights, is a visual experience you will never forget. 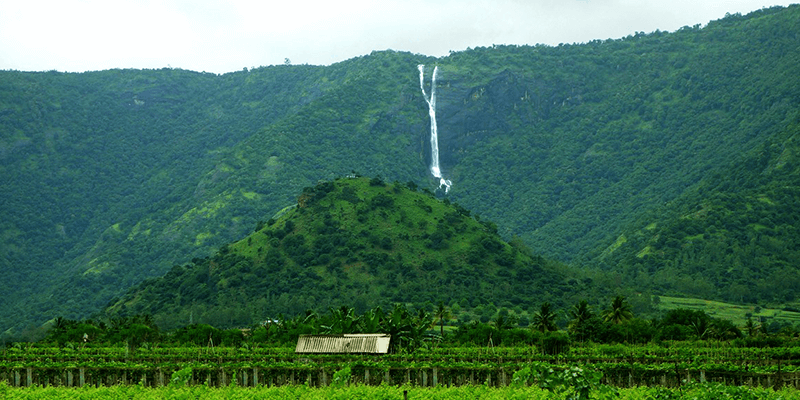 The tip of the waterfall also offers great views of the nearby plains that are covered with farmlands of different kinds. Trivia: This waterfall is not in Kerala, it is rather located in Tamil Nadu. Village life often comes packed with many surprises, for the citizens like you and me. So, just tip over to the other side of the border and visit the vegetable farms of Tamil Nadu. Farms here have various crops from cabbages to sunflowers, from tomatoes to marigolds, from cucumbers to coconut trees. You can view the farms, talk to the locals, and even purchase some of the garden fresh (luring) vegetables. And trust me, you would love the experience! Tip: As you make your way through the vegetable farms, you will come across several small villages. Try to interact with the locals. It will not just help you understand life in a different perspective. This is one of the most interesting spots covered during the Thekkady-Kumily road trip. The Lower Camp is a place which houses a set of sturdy pipes that were installed by the British to channelize the water of Periyar Lake to the irrigation lands of Tamil Nadu. The architecture is a marvel in itself as the pipes move down the hilly slopes of Kerala to reach the irrigation lands of Tamil Nadu. Now that the Britishers are long gone, it has become a matter of water conflict between the neighboring states. And since you have been fascinated by the story, you need to visit the canal area. This is where water from the pipes is collected and is properly channeled to the agriculture farms. The pace of the water here is scary and beautiful at the same time. Tip: Be careful whilst crossing the bridge across the canal as it is not barricaded. Along your road trip through the countryside of Tamil Nadu, you would encounter many grape plantations. 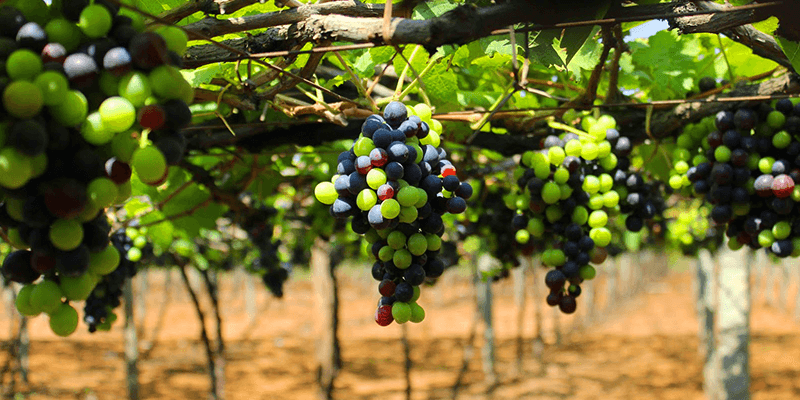 This region in Tamil Nadu is in fact one of India’s top grape producers. You can visit the farms and take some great photographs. While here, don’t forget to taste the grapes and the grape juice available outside the plantations. They are available in the most pure form and are one of the best things that you can ask for after hopping around places under the scorching sun. Tip: Don’t touch the grapes in the plantation as the act is completely forbidden. 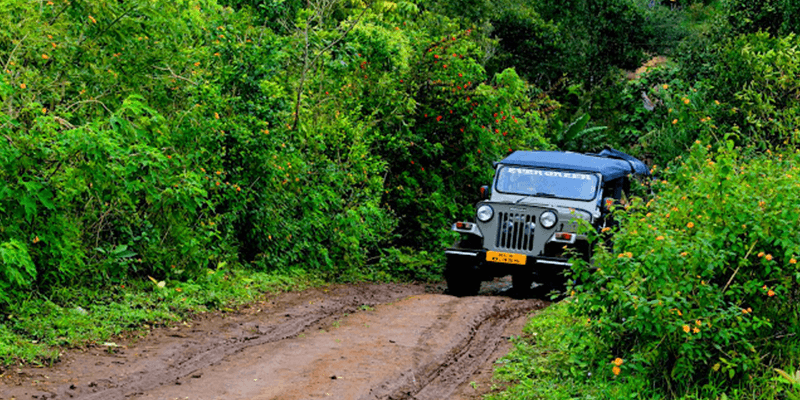 The second fabulous road trip you might embark on, while in Thekkady is along the Gavi trail. With the declining frequency of wildlife spotting at Periyar Tiger Reserve, many tourists are choosing to get off the beaten path and experience the emerald green Gavi Forests. Though this road trip starts with a Thekkady wildlife sanctuary safari, it has many other prospects. Let us explore these. Gavi forests have still not become the tourist hotspots and that is what keeps them pristine and quite. With prior bookings, you can embark into the forest at 5:30 AM and view the wild animals having their morning drinks! The forests are known to have a large population of wild elephants and you can have fun viewing them in their natural habitat. There are also high chances of spotting Tigers at Gavi! You can either explore the forests in a Forest Department jeep, or trek along. Once you are done with the safari, there is plenty to look forward to along the road. Tip: If you want to trek through the forests, do carry proper boots. 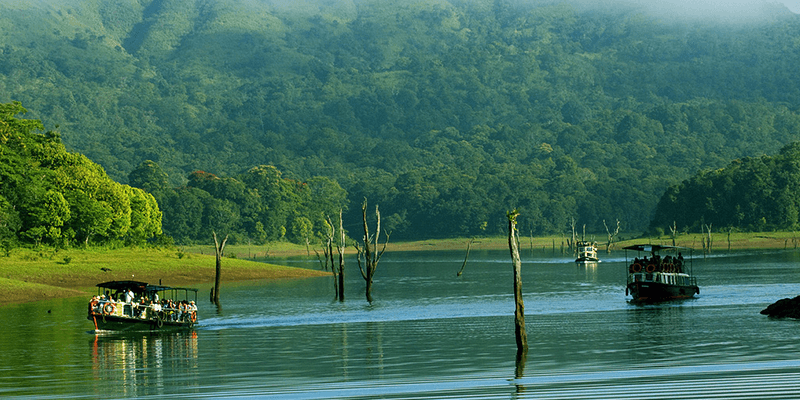 Gavi Lake, set on the outskirts of the Periyar Tiger Reserve, is a picturesque lake with forests bordering on either side. There is a lush garden on the shores of this lake. The lake is good for spending some leisure time before hitting the road. Have fun boating at the lake, and this also offers some great photography moments. If you care for some more adventure, then there are short treks too. Kerala is known as the Land of Spices, and a bit ahead from Gavi Lake you would find out why it is named so. You will be greeted with the smell of cardamom. 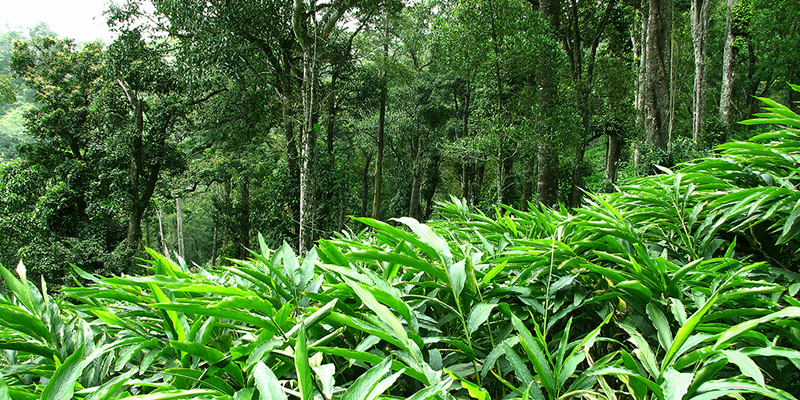 The area ahead is filled with cardamom plantations. Just halt for a while and breathe in the fragrance of these leaves or shop for some. These garden fresh spices are available at dirt cheap rates here. Tip: Stop by to purchase some garden fresh spices from the shops located just outside the plantations. As you move ahead, do care to stop by at the Sabarimala viewpoint. 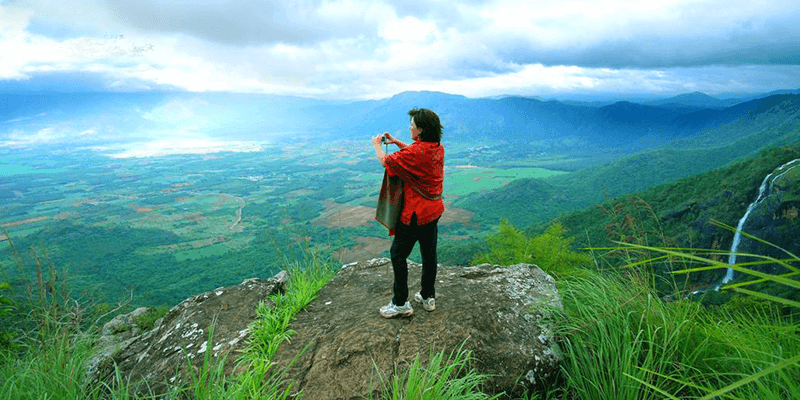 This spot sitting on hilltop offers a panoramic view of the Sabarimala hills and the pilgrimage point. Carry along your binoculars, to view the Sabarimala Temple from a distant. As the viewpoint is situated in a thickly vegetated area, you might even catch a glimpse of the elephants while passing through the stretch. Tip: This is an ideal location to catch a beautiful sunset. Your last stop for the day is at this unique museum. The museum houses the preserved skeletons of many animals. Along with the ambience of the museum, these skeletons seem to enthrall the senses of the onlookers. 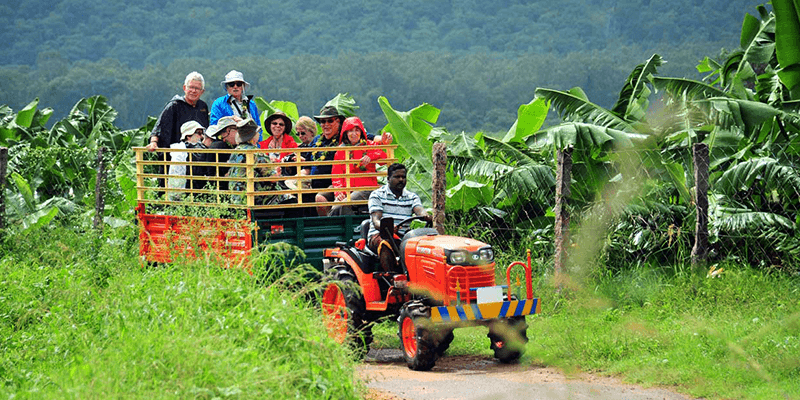 Hope we have helped you plan a trip to Thekkady that does not follow your usual tourist trail. Previous article5 Tips to get a confirmed PNR Ticket during heavy rush! Next articleGet Set for an Awe-Summer Family Vacation at Imagica! Wonderful article and pictures!! Quite some inspiration! Thank you. Keep reading our blogs for more of such interesting information.